Deep Learning/Machine Learning Applications: Machine learning is the technology of computer algorithms that operate based on its learnings from existing data. Deep learning is a subset of machine learning that focuses on deeply layered neural networks. The following companies utilize deep learning/machine learning technology in a specific way or use-case in their products. Computer Vision/Image Recognition: Computer vision is the method of processing and analyzing images to understand and produce information from them. Image recognition is the process of scanning images to identify objects and faces. 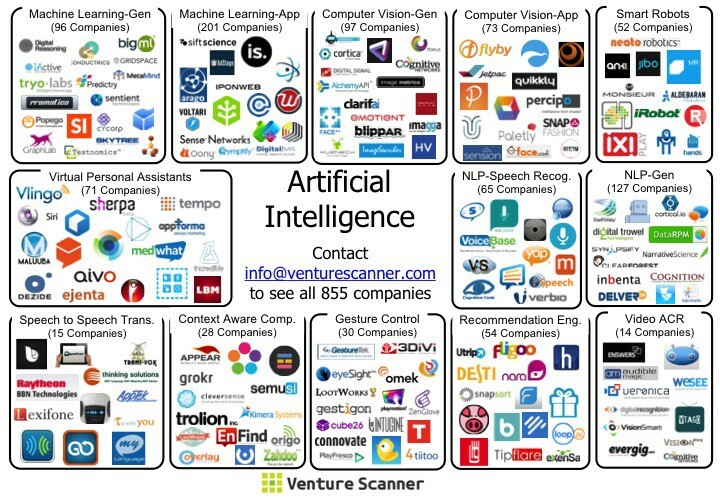 The following companies either build computer vision/image recognition technology or utilize it as the core offering in their products. Deep Learning/Machine Learning (General): Machine learning is the technology of computer algorithms that operate based on its learning from existing data. Deep learning is a subset of machine learning that focuses on deeply layered neural networks. The following companies either build deep learning/machine learning technology or utilize it as the core offering of their products. Natural Language Processing: Natural language processing is the method through which computers process human language input and convert into understandable representations to derive meaning from them. 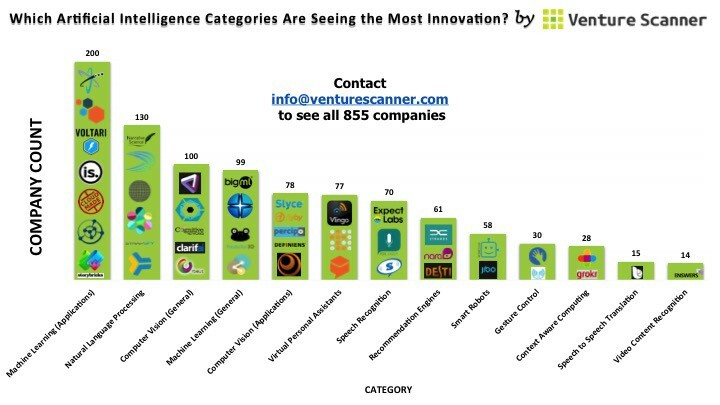 The following companies either build natural language processing technology or utilize it as the core offering in their products (excluding all speech recognition companies). Smart Robots: Smart robot companies build robots that can learn from their experience and act and react autonomously based on the conditions of their environment. Virtual Personal Assistants: Virtual personal assistants are software agents that use artificial intelligence to perform tasks and services for an individual, such as customer service, etc. Natural Language Processing (Speech Recognition): Speech recognition is a subset of natural language processing that focuses on processing a sound clip of human speech and deriving meaning from it. Computer Vision/Image Recognition: Computer vision is the method of processing and analyzing images to understand and produce information from them. Image recognition is the process of scanning images to identify objects and faces. 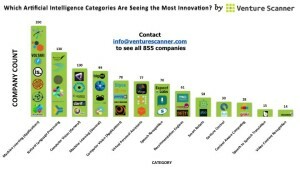 The following companies utilize computer vision/image recognition technology in a specific way or use-case in their products. Recommendation Engines and Collaborative Filtering: Recommendation engines are systems that predict the preferences and interests of users for certain items (movies, restaurants) and deliver personalized recommendations to them. Collaborative filtering is a method of predicting a user’s preferences and interests by collecting the preference information from many other similar users. Gesture Control: Gesture control is the process through which humans interact and communicate with computers with their gestures, which are recognized and interpreted by the computers. Video Automatic Content Recognition: Video automatic content recognition is the process through which the computer compares a sampling of video content with a source content file to identify what the content is through its unique characteristics. Context Aware Computing: Context aware computing is the process through which computers become aware of their environment and their context of use, such as location, orientation, lighting and adapt their behavior accordingly. Speech to Speech Transition: Speech to speech translation is the process through which human speech in one language is processed by the computer and translated into another language instantly. The bar graph above summarizes the number of companies in each Artificial Intelligence category to show which are dominating the current market. 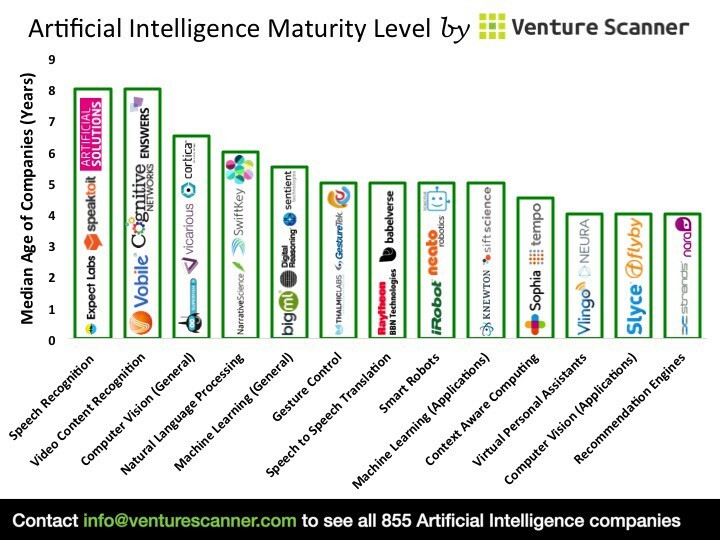 Currently, the “Deep Learning/Machine Learning Applications” category is leading the way with a total of 200 companies, followed by “Natural Language Processing (Speech Recognition)” with 130 companies. 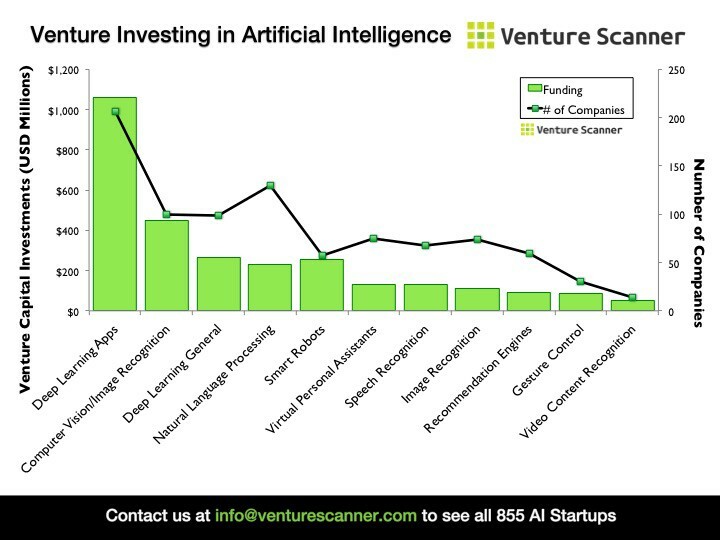 The bar graph above summarizes the average company funding per Artificial Intelligence category. 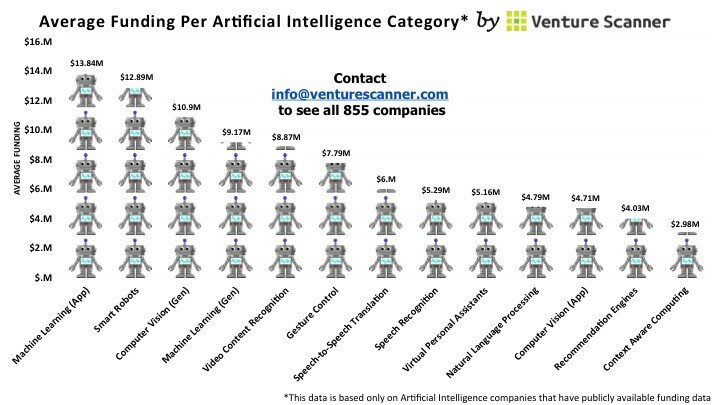 Again, the “Deep Learning/Machine Learning Applications” category leads the way with an average of $13.8M per funded company. The SEM category includes companies that help marketers with managing and scaling their paid-search programs. 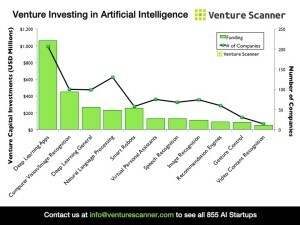 The graph above compares total venture funding in Artificial Intelligence to the number of companies in each category. “Deep Learning/Machine Learning Applications” seems to be the category with the most traction. The following infographic is an updated heat map indicating where Artificial Intelligence startups exist across 62 countries. Currently, the United States is leading the way with 415 companies. 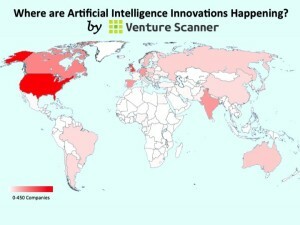 The United Kingdom is in second with 67 companies followed by Canada with 29. 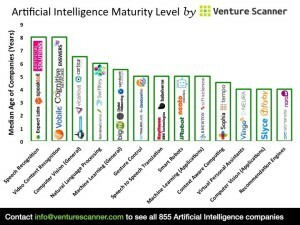 The bar graph above summarizes Artificial Intelligence by median age of category. The “Speech Recognition” and “Video Content Recognition” categories have the highest median age at 8 years, followed by “Computer Vision (General)” at 6.5 years.